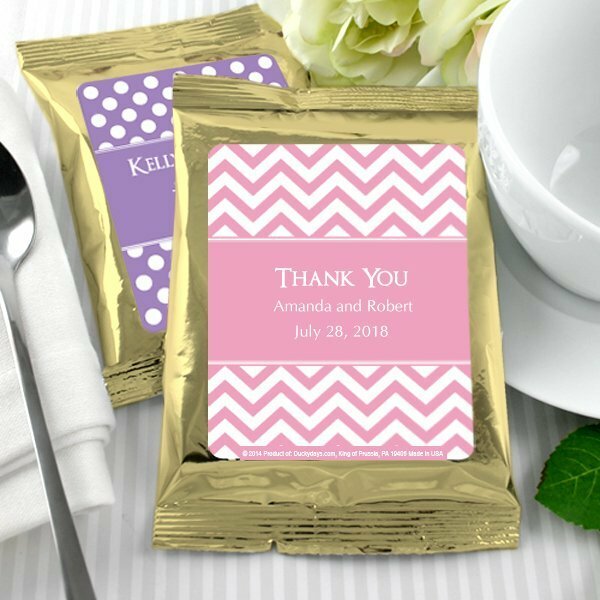 Celebrate your golden day with a stylish personalized coffee favor bag that makes a fantastic take-home gift for your guests. Each gold bag of coffee makes an 8-10 cup pot. Choose from a variety of classy silhouette designs and popular colors along with 3 lines of text.Easy Assembly with self-adhesive labels, or for an extra fee we will apply the labels for you. Coffee Packet Info: Each packet holds 1.75 oz of ground Columbian house blend coffee which yields one pot of delicious brewed coffee (8 to 10 cups). Packs are about 4.5" wide x 6" tall. 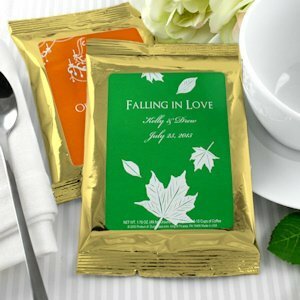 Coffee packets have a shelf life of 3 to 6 months and are certified kosher. Decaffeinated coffee is not available at this time. Yes, there's a single serving coffee inside the pouch.